A great option when you need your wristbands as soon as tomorrow. 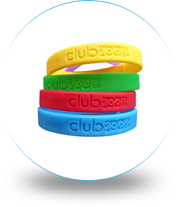 We offer high quality wristbands with 1 DAY PRODUCTION and NO MINIMUM ORDER. Order as little as 1 bracelet or as many as 10,000 for next day delivery. The only custom silicone bracelets with a contrasting message color that you can customize with 1 DAY PRODUCTION and NO MINIMUM ORDER. These bracelets come in an array of contrasting color combos. A budget friendly approach to custom design, screen printed bands are available from the simplest to the most expressive concepts. These “surface printed” bands are a great option for logos and designs requiring more than one ink color. An excellent way to make a statement! 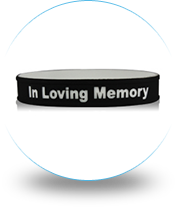 Messages or designs on these long lasting wristbands are debossed/imprinted and filled with contrasting, multi colored ink. Differing from the debossed bracelet, embossed wristbands feature a raised text/design. While no color is added to this band, the popularity of this product lies in the uniqueness of its raised feature. Sleek and attractive, ¼ inch bands are fashionable and can be worn stacked in a variety of colors and expressions all at the same time. Compared to the standard bracelet, these bands stand out even at half the width while still offering a fashionable way of expression. Popular and inexpensive, these bands are standard width. They are used worldwide by corporations, organizations and for personal fundraising or promotional purposes and an excellent way to raise awareness. They are a leading trend, and a prominent way to advertise messages. A popular choice of today’s generation, these bands are a great way to inspire, impact and motivate. 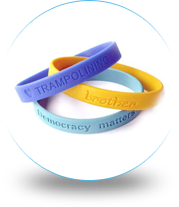 A great promotional tool, ¾ inch wristbands can accommodate larger logos or messages which require a larger font. Bold and impacting, these bands are a popular choice for larger fonts, logos and designs. An exceptional attribute to these bands is the fact that it can allow an additional row for messages that express more. Our 100% silicone, non-allergenic, latex free customized rubber wristbands are an ideal promotional tool, an artistic way to express yourself, raise awareness, champion causes, fundraise for charity, support your favorite team, brand your business, and a creative outlet for so much more! 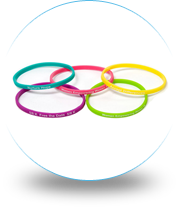 Especially popular for special events, these rubber bracelets are worn in the boardroom to the classroom, for birthday parties, family reunions, school spirit, In Memory Of, personal passions and causes close to your heart. A worldwide trend, customized silicone wristbands adorn the hands of celebrities, athletes, musicians, soccer moms, cool dads, and kids of all ages. Make a statement with these long-lasting, custom rubber bracelets and make an impact with your words. 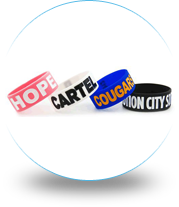 Some prominent causes customized rubber wristbands have aided include breast cancer, AIDS, bullying, patriotic, fundraisers for school proms and band equipment, team pride and church functions. Customized silicone bracelets have been a cheap yet effective way to campaign, support, fundraise, raise awareness, promote, and show pride. 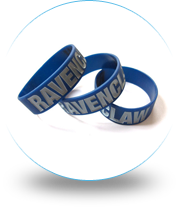 Available in a variety of sizes, custom rubber wristbands are offered in 1/4 inch, 1/2 inch, 3/4 inch and 1-inch widths. Choose from screen print, debossed, ink-filled and embossed and begin creating from a kaleidoscope of colors or let us match your custom color. Upload your own art or choose from our wide selection of clip art, and you are on your way to get a customized wristband of your choice. Intricate designs and colored logos? No problem! Corporate promotion requiring mass production? Search no further! 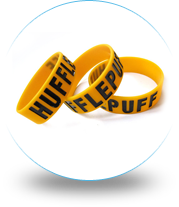 Need help creating customized rubber bracelets? Our user-friendly site offers a fun way to make your own wristband and our art department is skilled in captivating your ideas, mottos, catchphrases, art, and logos for your order. We take pride in our excellent customer service and know that our ability and patience to make your shopping experience a memorable one will only ensure your repeat business. 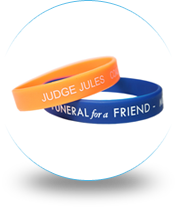 Make Your Wristbands is a budget-friendly approach to creating high-quality custom rubber wristband items for your promotional, charity, fundraising, celebratory, company/organization or personal causes. 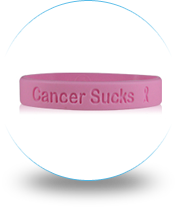 If you are raising awareness on a serious cancer or disease, we have cancer wrist bands to spread the word in a powerful way. Specializing in quality and quantity, our friendly staff are ready to assist you with your order from our wide selection. Look no further than makeyourwristbands for your customized 100% silicone, non-allergenic, latex free personalized rubber bracelet items. So what are you waiting for? Make your own wristbands and see exactly what your finished rubber bracelet will look like.